Russian Foreign Minister Sergey Lavrov claimed on Friday that Russian experts have “found no traces of chemical weapons” at the site of the attack in Douma, Syria. He accused foreign intelligence services of faking the attack to justify action against Syria and discredit Russia. 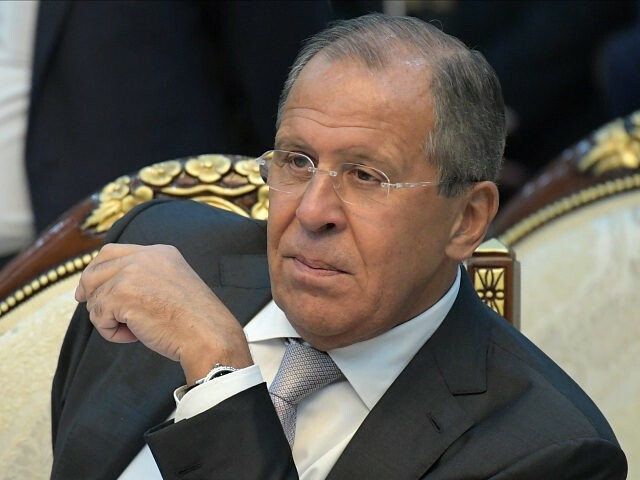 “We have irrefutable evidence that this was another staged event, and that the secret services of a certain state that is now at the forefront of a Russophobic campaign was involved in this staged event,” Lavrov declared at a press conference in Moscow. Later on Friday morning, the Russian military clarified that the foreign power Moscow suspects of staging the attack is the United Kingdom. The Russian Foreign Ministry denounced reports of the chemical strike in Douma as “fake news” spread by the Syrian volunteer civic defense group called the White Helmets. The Russians accused the White Helmets and “other pseudo-humanitarian organizations headquartered in the UK and U.S.” of working “hand in glove with terrorists” to provoke military action against Syrian dictator Bashar Assad. The White Helmets are not the sole source of information about the Douma attack. Other Syrian opposition groups have reported living and dead victims in Douma with signs of chemical exposure. The World Health Organization received extensive reports of patients with symptoms of toxic exposure from its medical partners in Syria. On Thursday, U.S. officials said American experts have examined blood and urine samples from victims in Douma and concluded they were exposed to both chlorine gas and a nerve agent. Presumably, Lavrov and his ministry would dismiss all of these sources as conspirators in a grand plot against Assad. “God forbid anything adventurous will be done in Syria following the Libyan and Iraqi experience,” Lavrov added at his press conference, in a dig at the U.S. government. “Even non-significant incidents would lead to new waves of migrants to Europe and to other consequences, which neither we nor our European neighbors need,” he warned.